1961년 출범한 이태리 TITICI는 새로운 카본 레이업 공정과 혁신적인 기술을 향한 지속적인 노력을 통해 사이클리스트들의 보다 새롭고 만족스러운 라이딩 경험을 실현하고 있다. Flexy frame은 당신이 경험해보지 못한 최고 수준의 성능과 편안한 승차감을 동시에 실현해 준다. 최고의 사이클 선수들의 경험과 요구를 반영하여 디자인된 Flexy frame은 다른 카본 프레임에서는 볼 수 없는 아래와 같은 차별적인 기술들이 적용되고 있다. Flexy frame에 적용된 PAT technology은 가장 두드러진 차별적 기술로 Flexy라는 단어가 붙는 이유이며 이 덕분에 shock absorbers없이도 승차감의 수준을 최대로 제공할 수 있다. 이 특허등록된 디자인은 toptube의 형상이 headtube와의 결합부분에서는 oversized box-section을 가지지만 seattube쪽으로 가면서 매우 얇고 평평해지는 leafspring-style design을 띤다. 이러한 Titici 'flexy concept'은 자전거의 후방의 승차감을 향상시키며 도로 진동을 더욱 잘 흡수하면서 측면 강성은 더 강해진다. Plate Absorber Technology design는 표준적인 카본 튜브 형상의 프레임보다 평균적으로 18 percent 정도 승차감을 향상시키면서 동시에 강성은 동일한 수준을 유지하게 해준다. 보다 나은 성능을 발휘하는 독자적인 프레임 생산을 위해 wrapping technique을 통해 각 카본 부품을 직접 내부에서 제작하고 카본 섬유에 보다 깊이 스며드는 slow resins을 사용하는 일련의 진보적인 적층 공정과정을 통해 각 카본 부품을 결합한다. 높은 수준의 강성, 반응성, 내구성을 실현하면서 각 라이더들의 신체와 라이딩 스타일을 반영하는 세심한 custom 제작도 가능하다. 모든 프레임은 이태리 자체 공장에서 handmade로 제작되며 1K와 3K unidirectional T800 carbon fibres를 소재로 사용한다. Flexy gravel frame은 다양한 환경에 대응이 가능한 versatility를 염두해두고 디자인되었다. TITICI is a long journey begun in 1961, the goal of which is the continuous search for new constructive processes and innovative technologies in the carbon frame world. Our mission is to improve our customers' driving experience. To produce ever better performing and exclusive frames we decided to make each piece with the wrapping technique. Each item is created internally by itself and is then put together with other elements through a series of progressive wrapping steps with slow resins that enter deep into the fibres. A meticulous process that allows each customer to have a bike that’s made to measure for your body and your cycling style, with the highest standard of stiffness, responsiveness and durability. Because people are not all the same. Neither are our bikes. It’s not the road getting easier. It’s your riding getting better. With Flexy you can combine maximum performance with the comfort and ride you've never had before. Born from the experience and needs of some of the best professional athletes, Flexy is now available to anyone who wants a bike made to fit their body and cycling style. Thanks to the PAT technology of Flexy frames, bike comfort increases even without shock absorbers. The patented design sees the toptube taper and flatten from a oversized box-section at the junction with the headtube, to a razor-thin, leafspring-style design at the junction with the seattube. Titici's 'flexy concept' is said to improve comfort through the rear end of the bike. "The shape is better able to absorb road vibrations but, at the same time, the tube is very rigid," says Titici's brand manager, Roberto Sambinelli. To put a number on it, Titici says the Plate Absorber Technology design increases comfort by an average of 18 per cent over a 'standard tube frame', while maintaining stiffness. That's the claim, anyway. All Titici frames also have a headtube badge which can be scanned by a smartphone to order to pull up the bike's five-year digital warranty and service history. 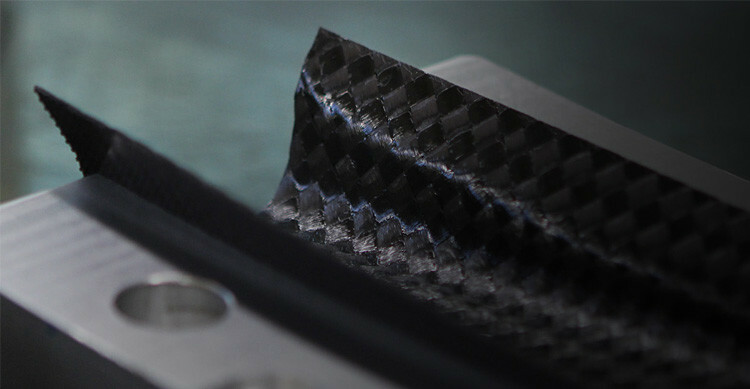 All frames are handmade to order in Italy from a combination of 1k and 3k unidirectional T800 carbon fibres. Titici's frames can also be customised according to the build, so if you're planning to have an electronic groupset, you can ask for the frame to only have ports for Di2 or EPS wires, and no bungs covering defunct mechanical cable ports as you'll find on most cross-compatible frames. Same goes for SRAM eTap - if you choose the wireless groupset, you can ask for the frame to be completely free of shifting cable ports, though that could limit the upgrade potential of the frame. The gravel frame is designed with versatility in mind.